It’s October and all things creepy crawly come out to play! 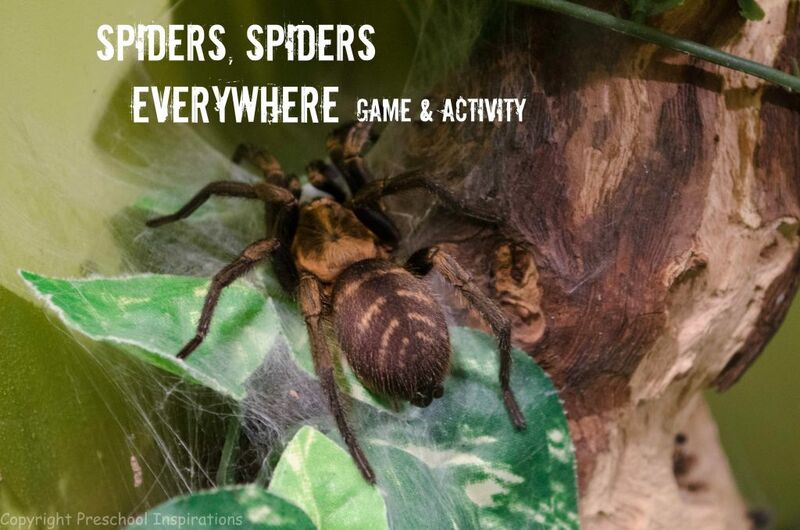 We at Preschool Inspirations want to help you celebrate spider week with a fun little printable game and optional activity using real photos of real spiders. 1. If you haven’t already, download and print a copy of the Spiders Spiders Everywhere file. 2. We included 2 options for you to select which would work better for your kiddos. There are spiders with suggested cutting and folding indicators (page 3 and 4). To use these, print on card stock. Cut out the individual spiders and gently fold on the dotted lines. You will end up with spider cards that “stand.” Or you can print the “flat” spider pictures on page 5 and 6. There are suggested outlines to cut; these spiders won’t be folded but will remain flat so you can more easily laminate them. 3. Glue a thin magnet (magnetic tape or printable magnet sheets cut into small pieces work well for this) to the underside of the standing or flat spider. **Make sure to test the polarities of your magnets so that the fishing pole or magnet net will attract the spider’s magnet. 4. If you have one, you can use a magnet fishing pole from other toys or puzzles. If you do not have one or need more, you can always use any small stick/bamboo cooking skewer /even straws with string and magnets to make your own. 5. Print and assemble the spider dice. 1. For self-directly play or quiet time, one child can place the spiders on the floor or table. S/he roles the dice and catches the matching spider to rescue it. Play continues until all spiders have been rescued. 2. For playing as a game with 2 children, have the kids place the spiders on the floor or table. Each takes turns rolling the die and catching the matching spider. 1. Using an existing sensory table (or use a box from underneath a case of water or similar type of box) string yarn throughout to make a “web.” Children can “hunt” the flat spiders and other spider-related items such as plastic spiders and flies which can be purchased in many stores around Halloween. You can add round magnets or a magnet strip for this activity. A great book to read alongside with any spider activity is The Very Busy Spider. This fantastic spider game has been created by the very talented Marta!